A beautiful giant three foot confetti filled balloon sure to add the wow factor to any party! A gorgeous giant balloon ready to be inflated by you for a party, wedding or any special occasion! Sure to add the wow factor to any occasion. Please note the delivery time for the giant balloons is 1-3 working days and the balloon is sent flat ready to be filled with helium by you. 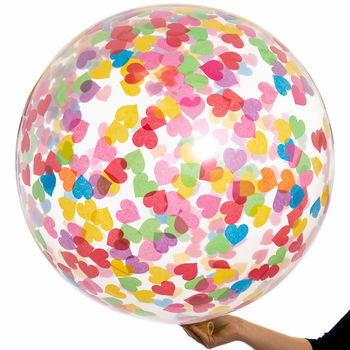 Useful tip - partially fill the balloon with air to create static in the balloon to make the confetti stick to the sides! The pyramid weight will only secure the balloon if it is partially filled with air. Co-ordinating items are available in this range. The balloons are made from excellent quality latex - the balloon choice of professionals. Because they are made out of latex when filled with helium they will not be crystal clear but will remain slightly cloudy. The balloons are supplied flat packed ready to be filled with helium by you. You can choose to add a cannister of helium to your basket with the balloons. These disposable canisters have a latex regulator fitted as standard and you simply wrap your balloon over the end and fill. One of these canisters will fill two, 3-foot Balloons to 70cm each. For the three foot balloons on the day our recommendation would be to have a tape measure, get two chairs and measure a space of 70cm between the two chairs, blow the balloon up with the helium in between the two chairs until it is touching each chair. The balloon is approximately 70cm when blown up. This product is dispatched to you by Bubblegum Balloons.